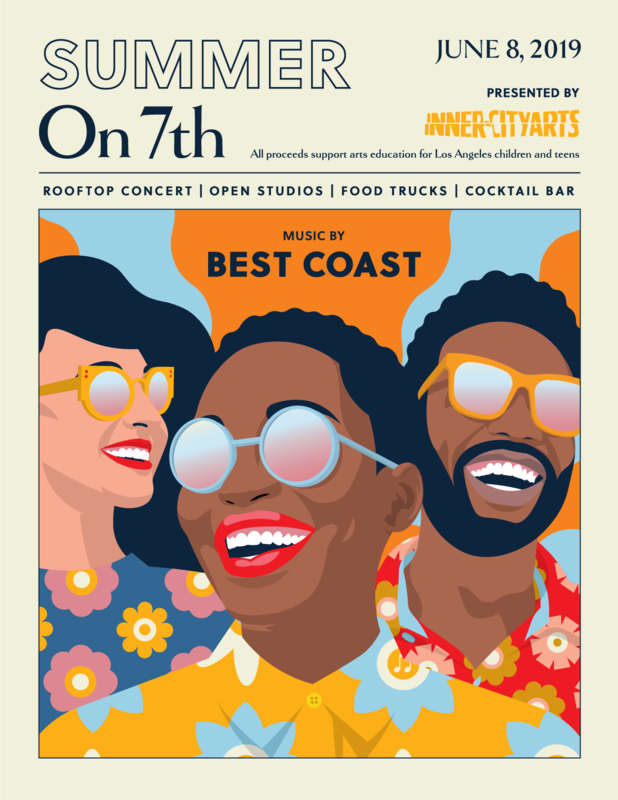 Inner-City Arts proudly announces “Summer on 7th 2019,” a summer concert benefit taking place on Saturday, June 8 on our campus. All proceeds from this event support our mission to provide high quality arts instruction and programming for underserved youth in Los Angeles. Each summer, we are thrilled to welcome friends—new and old—supporters, and arts and culture lovers from across Los Angeles to our campus to celebrate the transformational power of creativity in community and support of our work. Against the skyline of Downtown Los Angeles, over 1,000 guests enjoy a rooftop concert, art installations, food trucks, drinks, and tour our studios. This event, presented by Inner-City Arts and with concert by Spaceland Productions, will feature a performance by Best Coast. Cocktails and libations will be sold by Silverlake Wine and Everson Royce Bar. Additional participating artists, food trucks, and partners to be announced! This event is 21+ only. Food and drinks available for purchase.